When chef Alexandra La Noue-Adler and her husband, Adam Adler, purchased Quechee’s Parker House Inn & Restaurant eight years ago, it was in something of a rut. The stately 1857 inn had good bones and a plum spot overlooking the Ottauquechee River, but it also had a fusty interior and reputation. The Adlers, fresh from turning around an inn in Maine, were undaunted. They took to renovations with zeal — planting kitchen gardens, adding a funky bistro with tables on the wraparound terrace overlooking the river and giving the fire-lit dining rooms a French provincial vibe. They also introduced La Noue-Adler’s French-inflected food, and steadily built a following. Now the Parker House is a popular spot with both locals and tourists. Many of them get to meet the effervescent La Noue-Adler, a baby-faced blonde who often pops out of the kitchen to mingle. While her husband works the bar and manages the front of the house, La Noue-Adler turns out polished seasonal fare — mussels in an earthy saffron broth; salmon topped with panko, roasted pistachio oil and strawberry chutney; rack of lamb in a honey-lavender reduction. 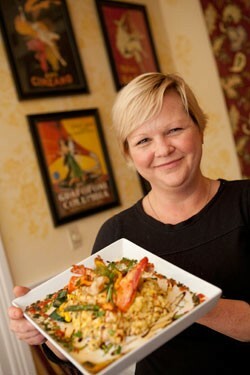 Like her, the menu is colorful, gutsy and original. Though many of her dishes embody a respect for classical French cuisine, La Noue-Adler didn’t come to chefdom via traditional training. Rather, hers is a lifetime of eating, cooking and learning by doing. La Noue-Adler, 42, grew up in Manhattan and Brooklyn’s bustling Fort Greene neighborhood. She absorbed the French style of her father’s cooking and, on the street, sampled ethnic dishes that would come to influence her style. She attended a high school of music and performing arts, earned a degree in early childhood education from New York University, and taught in Chinatown. “My problem was, I wanted to take all of the kids home with me and make them better,” she recalls. Next came a stint in publishing, but since La Noue-Adler “hated sitting behind a desk,” she did an about-face in her mid-twenties: She started making sandwiches and selling them to local delis, and managed one in the East Village. Time at a Hudson Valley catering company and at a seafood market followed. When La Noue-Adler found out she was pregnant with their first child, she and Adler decided to find a quieter place to raise their family. They came across an inn in Bethel, Maine — one that needed a lot of work — and made an offer. “To our shock and horror, they accepted,” she jokes. The couple opened L’Auberge Country Inn in 1999. In Maine, La-Noue Adler had the couple’s second daughter. “Later, I used to cook with her on my back,” she says. In 2004, a buyer surprised the Adlers with a too-good-to-refuse offer on the inn. After scouring New England for another, they purchased the Parker House. Each year was better than the last, and the place earned accolades from the Boston Globe and Yankee magazine, among other publications. Then, on August 28, came Tropical Storm Irene. La Noue-Adler says she never expected the flood. That afternoon, she watched as Dumpsters and propane tanks crashed by in the increasingly violent Ottauquechee River. By 4 p.m., Parker House’s basement was under water, and the river was lapping at the porch. The nearby covered bridge in Quechee was disintegrating under the river’s force. La Noue-Adler left for higher ground with their children, and her husband was forcibly evacuated from the inn at seven that night. The next day, they found the lower level of the Parker House destroyed. Everything in the basement — including a $7000 food order delivered the day before the storm — was covered in muck. “It was incredible devastation, and very tough. It’s kind of a blur, those first two weeks after Irene,” La Noue-Adler says. Friends, customers and neighbors pitched in to help. La Noue-Adler juggled phone calls with local officials as the couple tried to save their home, whose plot had been eroded by the storm. Alexandra La Noue-Adler: When I was very young, I ate a lot by myself. My father was an artist and lived in a loft. At the time, I didn’t know it, but we didn’t have much money. Even so, at his house it was always more traditional French, with salad as the last course and crudités on the table. Sometimes he would cook dinner on a hot plate. So, food and comfort and stability have always been intertwined for me. I’m 12 years older than my brothers and sisters, and, as I got older, I took care of them after school. I cooked for them and baked cakes. It gave me my first taste of Wow, I can cook something and watch them really, really enjoy it. SD: Did you eat out a lot? ALA: My parents loved food, so when they were together they both went out a lot and cooked a lot. I was exposed to all different kinds of foods when I was younger — mostly Ethiopian and Jamaican and Puerto Rican. SD: Were there any foods you wouldn’t touch as a child? ALA: I don’t think so! My nickname was Beanie, because I loved lima beans so much. I could eat a bowl of them with butter and salt and be as happy as anything. The only thing I’ve never been too fond of is ricotta cheese. I don’t like the texture. SD: What’s the most offbeat thing you’ve ever tried? ALA: Maybe rattlesnake. I’ll try anything once. SD: What ingredients are always in your pantry? ALA: Everything. It goes back to me feeling like I never had enough food as a kid — I hoard food. World War III could happen, and we would be OK. But we always have marinated artichokes, capers, sun-dried tomatoes. I grow a lot of basil, and so I usually purée that, put it into ice-cube trays and freeze it, so I always have pesto and basil. SD: If you’re trying to comfort someone close to you, what do you make? ALA: I make this thing we call “stoup.” It’s a soup, but it’s a stew, with chicken, cabbage and shiitake mushrooms. You cook it all day. I’m a big soup maker. SD: What about to impress someone? ALA: Probably a bouillabaisse. The presentation is always so gorgeous. Anything seafood — if I could have a totally seafood restaurant, I would. ALA: I have a collection of over 1400 cookbooks, especially antique ones. I’ve found great recipes in antique cookbooks. For day to day, though, I look in the Silver Palate cookbooks, because you can always find something good in them. Even though I shouldn’t say this, I also have all of Gordon Ramsay’s cookbooks, because he’s an amazing cook. SD: What music do you listen to in your kitchen? ALA: That’s easy. On a busy night, zydeco. SD: What local restaurants do you visit when you’re not in the kitchen? ALA: It’s hard to find time, but when we do, we go to Yama [in West Lebanon, N.H.]. Every time I go there, I try something different. SD: What is your favorite beverage? ALA: I drink a lot of Orangina. SD: Where do you like to travel for food? ALA: I love Morimoto in the Chelsea Market [in New York City]. My daughter and I] just sit at the sushi counter and just eat lunch. It’s probably one of the most pristine eating experiences. Adam’s father has a place in Spain, and one of the best experiences we’ve ever had is sitting on the beach there, drinking sangria and having grilled sardines — sardines that were grilled on an overturned boat. SD: If you could have any other chef in the world prepare a meal for you, who would it be? ALA: Probably Gordon Ramsay. I love his attention to detail. The same with Morimoto — I really love the attention to detail and layering of flavors. It’s very clean food. To do it correctly is very hard. SD: What was the last thing you ate? ALA: Tamari almonds and a glass of milk. I’m a tamari almonds connoisseur, and the ones from Hannaford are the best. SD: What do you like most about what you do? ALA: I really enjoy taking care of people. I get something out of that. It satisfies the need in me to take care of people. And being paid to be creative is the most amazing experience.